After a long time of waiting and checking out rumors, the Google Pixel 3 finally gets officially revealed. We received information about it just yesterday from Googe. Time to check it out! First things first, the Operating System. You were probably expecting this, but both devices will be coming with Android Pie out of the box along with all of its new features like Digital Wellbeing, Adaptive Battery, and more. One new feature that caught our eye is Call Screening. Call Screening kinda works like voicemail. When you receive a call, you get the option to press the corresponding button which activates the kind of fake voicemail and you get to hear what the caller needs – then you can decide what to do accordingly. This can come in handy for busy business people. 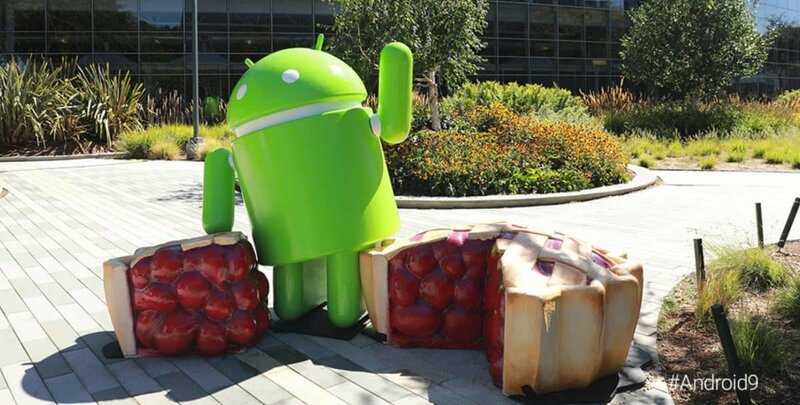 While Call Screening is only available for the Pixel 3 and Pixel XL right now, Google mentioned that it will eventually be delivered in all Pixel devices. Last, but not least, both of these new devices from Google will receive guaranteed software support (aka software and security updates) for the next 3 years. Both the Pixel 3 and the Pixel 3 XL come with a back that’s made of glass. One big difference in the front is that the Pixel 3 XL has a notch, while the Pixel 3 doesn’t. As for colors, you can choose between pink, black, and white. Or as Google calls them: Just Black, Clearly White, and Not Pink. Yeah, we don’t get that last one either. Probably Google’s sarcasm or something. Over here you can see the notch of the Pixel 3 XL. Like it or not, if you need the larger version of the Pixel 3, then you’ll have to deal with the notch. And to be fair, there’s nothing surprising about that. After all, we’ve seen the notch in numerous leaks before – mostly in some of our weekly news roundups. Speaking about size and notches, the Pixel 3 comes at 5.5 inches while the Pixel 3 XL comes at 6.3. As for which one to pick, well, it’s all a matter of personal preference. Maybe size matters after all. As we mentioned above, the Pixel 3 XL equips a screen of 6.3 inches while the smaller variant comes at 5.5. However, it’s not just the size that matters but the resolution and the display technology as well. 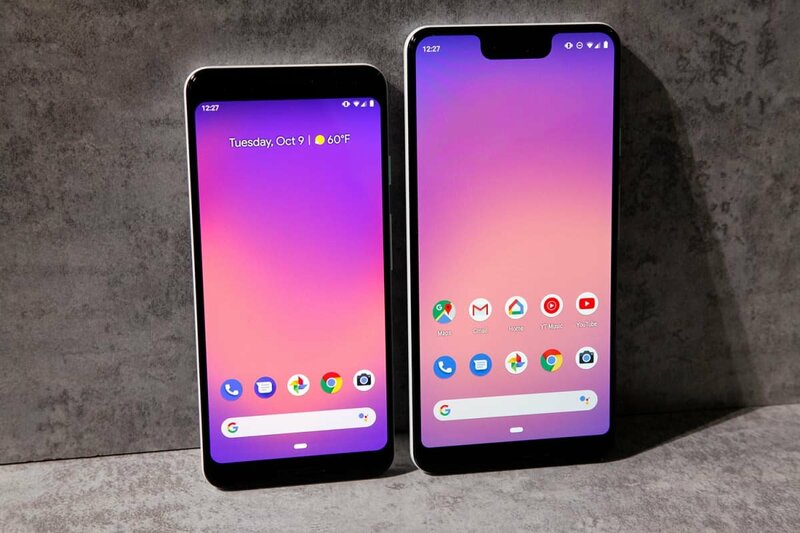 So, with that being said, both of these devices feature an OLED display with the Pixel 3 sporting a FULL HD+ resolution at 1080 x 2280 while the larger Pixel 3 XL has a QHD+ resolution at 1440 x 2960. 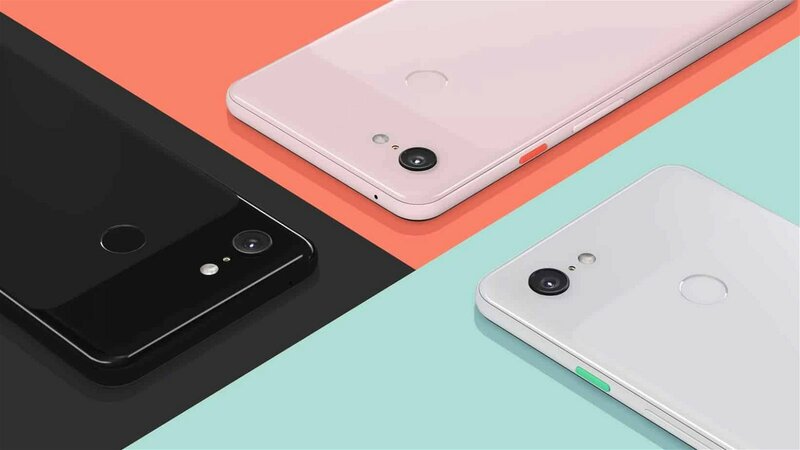 If pixel density matters to you, then you’ll be glad to know that the Pixel 3 has a ppi of 443 and the Pixel 3 XL has a ppi of 523. When it comes to cameras, Google hasn’t changed their minds. Both of the new Pixel devices still sport a single rear camera at 12.2 MP. Selfie cameras come at a dual setup with the combination of 8+8MP. One of these cameras features an ultrawide lens so that you’ll be able to capture selfies with a wider field of view. Time to express your self-ie. At this point, it’s worth mentioning that Google has added dedicated hardware for the camera in both of these devices. That hardware is called Visual Core – a dedicated processor which assists with various camera features. 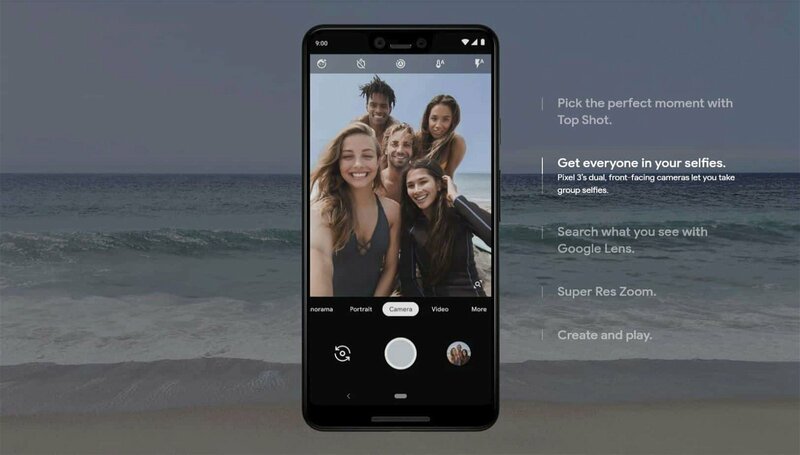 Top Shot: when you take multiple pictures at once, Top Shot will automatically pick the best one for you. By using Top Shot, you shouldn’t come across too many pics where people have their eyes closed or anything similar. Night Sight: this feature uses AI to brighten your dark pictures without losing too much quality. At the massive surprise of nobody, both the Pixel 3 and Pixel 3 XL are using the Snapdragon 845 chipset. With that being said, the CPU is an 8-core processor with 4 Kryo 385 Gold cores at 2.5 GHz and 4 Kryo 385 Silver cores at 1.6 GHz. Let’s not forget to mention that for a GPU, we have the Adreno 630. When it comes to storage, we’ve got 4 gigs of RAM and either 64 or 128 gigs of storage. As for the battery, the Pixel 3 has a 2915 mAh battery while the XL version has a 3430 one. 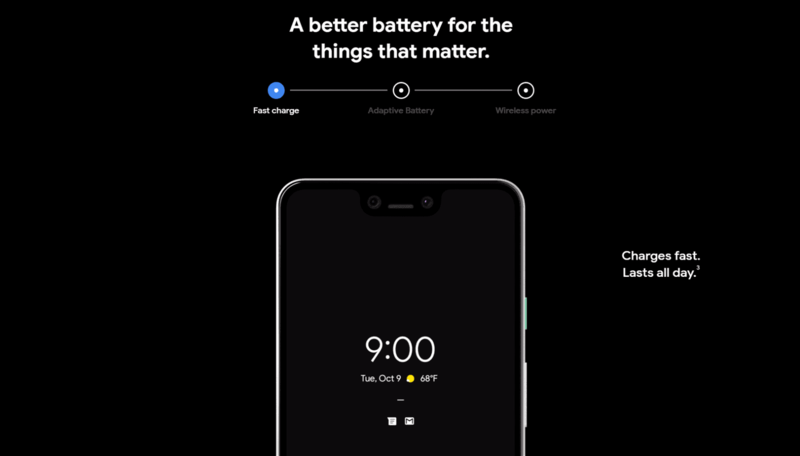 Now, Google says that the battery “charges fast and lasts all day”, but, theoretically speaking, a heavy user may have an issue getting through the whole day with something less than 3000 mAh. Hopefully, the Adaptive Battery feature will help with that. The Pixel 3 and Pixel 3 XL will be available through Project Fi, Verizon, Best Buy and Google Play Store. Pre-orders have already started and both smartphones will be available after the 18th of October. The Pixel 3 will cost 800 bucks and the Pixel 3 XL $900. This is most likely for the USA. We currently don’t have any information regarding Europe and other regions but we’ll keep you updated once we find out. So, do make sure to check out our weekly roundups. So, all things considered, both the Pixel 3 and the Pixel 3 XL offer a great camera, adequate battery, great performance, a sleek Android experience, and a rather minimalistic design without too much fancy stuff. Finding a negative aspect is not an easy thing to do. Sure, the new price tags may be a little bit intimidating for a lot of people. But, other than that, no matter how you look at it, the two new Pixels are all around great smartphones. Feel like we forgot something important? Then please let us and the whole world know about it in the comments down below! Like what you see? Then don’t forget to follow us on Facebook and Twitter for the latest news, reviews, listicles, apps, games, and more!